Soo..Gear Up variants- you’ve had your say.. some of you like it and some of you don’t. The question I’ve gotten a lot over the past week is will I pick them up when (or in regards to Australia - if?!) they come out.. I gotta say I’m pretty sure we will. We’d like to think our current Nerf blaster collection is pretty comprehensive; I’m a completionist and have pretty much picked up everything Nerf can bring out (sometimes even 2 or 3 of them), regardless of whether I actually like it:P Other than the Sonic series Deploy and the Clear Vulcan, we’ve done pretty well to acquire the current lineup (emphasis on current- no, no Airtech’s or Crossbows..). Although I would have liked to see more variety with blasters than just the usual suspects- I do actually like the ‘alert tape’/’construction site’ paint scheme, and I especially am looking forward to the updated Raider even though there is already a clear variant. The Raider is one of my favourite blasters so I don’t mind owning several of them and at least three of the four Gear Up blasters will support a stock attachment so it’ll be nice to coordinate amongst them (.. assuming you DO get all of the range!) I personally believe they would have done a LOT better if they repainted the Stampede, Alpha Trooper, Spectre and Barrel Break- IMHO that would have been a much more suitable “gear up VS the Vortex” line that would probably be enough of a stimulus to get people buying. Still.. it is what it is. With all the whinging and complaining though, the one thing to remember is ultimately no-one’s forcing you to buy them. Like with the 'Clear the Way's' and the 'Sonic Series', they’re not replacing or discontinuing the existing line, they’re a short burst run that’ll be gone by September/October. No doubt there’ll be plenty of repaints in the future.. so how abouts we get in early folks; what blaster and repaint design combination would attract you to buy a variant? Brought to our attention by 'Mr Racoon'- Some promo images of the upcoming Gear Up N-Strike line- the Recon CS-6 and the Maverick REV-6 on the Japanese Amazon. 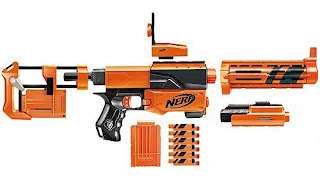 I am a lil' over the Maverick and Recon and personally think they should rotate the limited edition blaster lines (I mean seriously, HOW many Mavericks do you really want!) but at least there will be a Barricade and Raider as well. 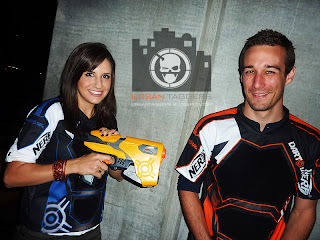 The Lazer Tag Phoenix LTX line has been to date the best home laser tag line I've personally used; Bazookified from Tactical Tag have taken it one step further and reshelled a Phoenix LTX into a Nerf Stampede ECS. 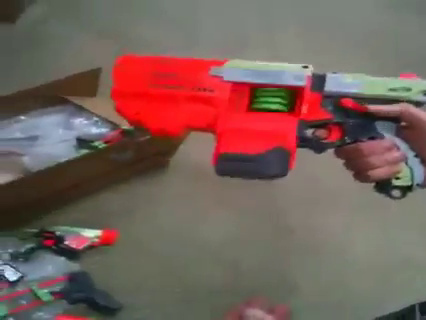 The results (especially the reload system) are AWESOME. Check out the blog for more details on this project. 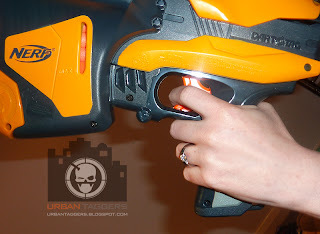 Rant: Vortex shoots discs. Is this really that bad? 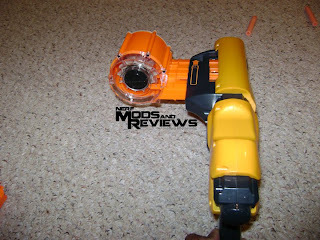 These days most common question in the toy blaster world is ‘what are the ranges’. . Less than a year ago, fans screamed for a new clip based, automatic blaster that came with innovative attachments and utilised a direct plunger mechanism. Nerf answered with the Stampede ECS.. and people still complained due to its “decent but not awesome” performance. 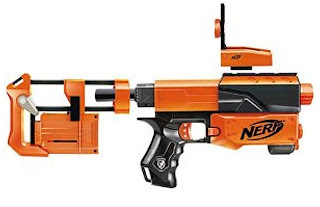 Disregard aesthetics, build quality, innovation- ultimately, distance is king- the message now is get a blaster to shoot further and you’ll have everyone lining up with their wallets stocked with cash and a gleam in their eye...or not. 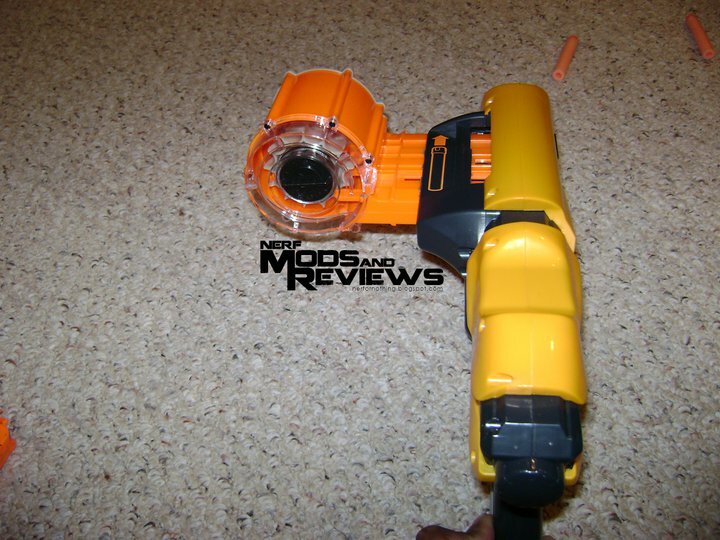 "Another awesome feature we can confirm about the new Nerf Vortex line? 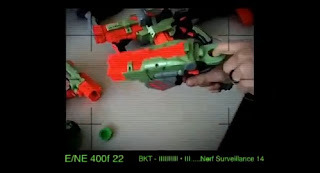 Most incorporate the same Tactical Rail system as Nerf N-Strike blasters – meaning that your Vortex and N-Strike accessories will be compatible with both lines. Get ready to take your Nerf collection to the next level. Keep your eyes on the page for more official info reveals on the Vortex lineup...there's much more to come." 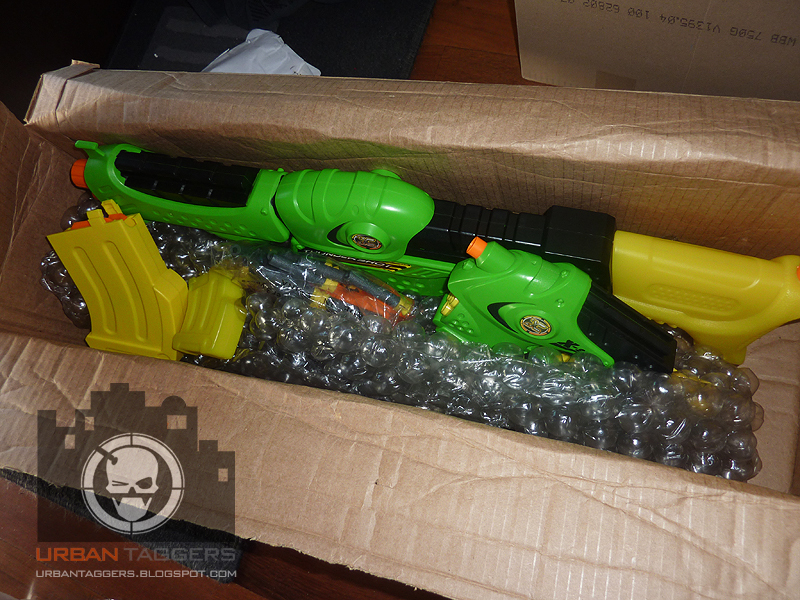 One of our readers, "Pinky" sent us a very informative analysis of the Nerf Vortex teaser vid. We thought we'd publish it, because.. well he's done all the hard work for us:) He's broken down the blasters and matched them up with the names that we published a while ago from the German website we found. All and all, check it out after the jump. "Hey Nerf Nation, we'll be revealing more Vortex collection details & pics here soon! 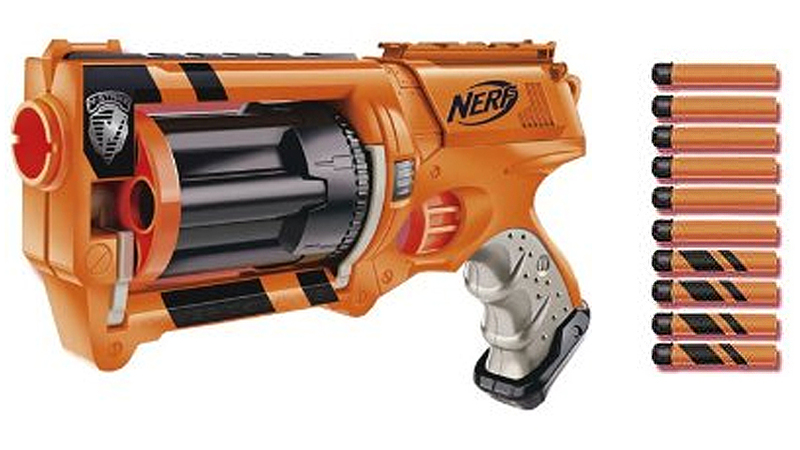 Just know, the performance and power you look for from Nerf blasters holds true with the Vortex line and the N-Strike line isn't going anywhere (get ready for the ultimate Nerf collection). Can't wait for you to test out the Vortex line firsthand, in action! Hope you'll keep up the hype with us until the chance arrives on 9.10.11." 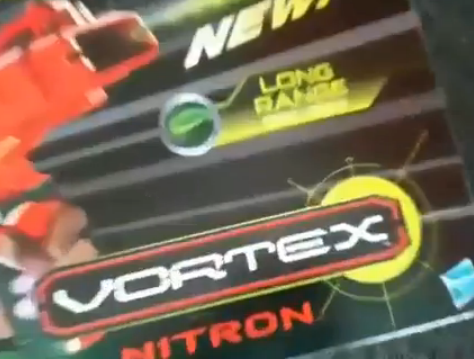 Sooo.. as we said, N-Strike'll still be around.. which makes sense with that whole "N-Strike vs Vortex" thing they were plugging at the Toy Fair.. Interesting stuff eh? What do you reckon? "Featuring never before seen XLR Disc Technology?" 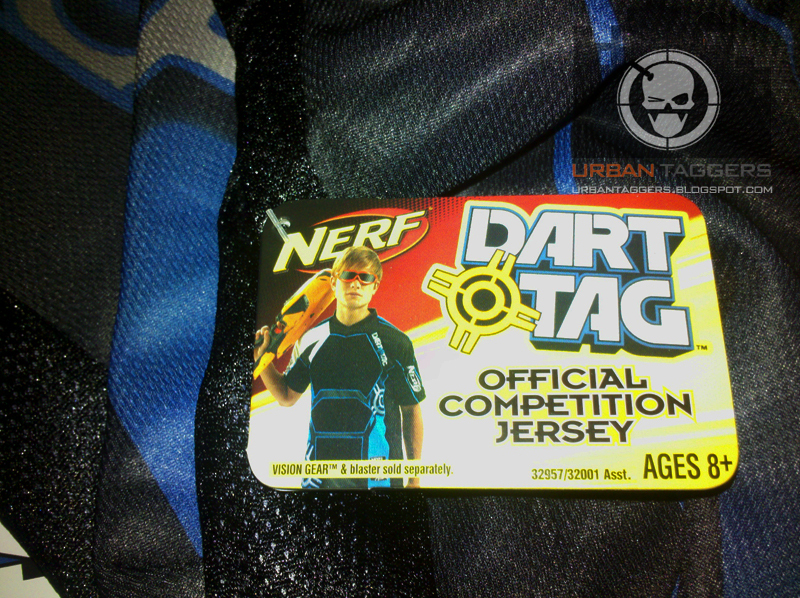 I'm more impressed by their 'Progressive styles" :P I'm a progressive kinda guy..
Urban Taggers + Nerf Mods + Reviews: continued..
Speedload 6: still time to enter and win! 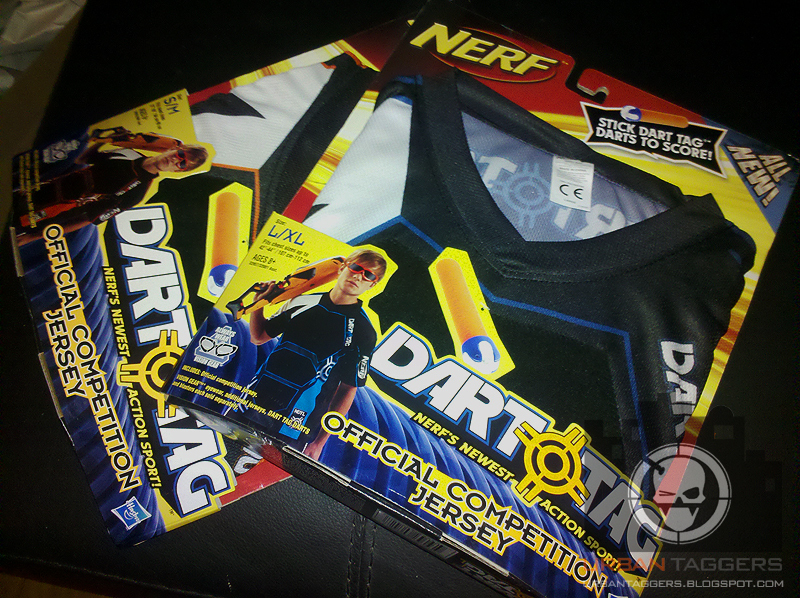 Aussie Nerfers, we're keeping the competition open for the weekend to allow you one last chance to enter to win! 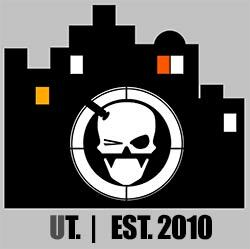 You need to have Facebook and like our page, mainly so we can identify who's entry goes with who's (it's hard to validate entries on here, anyone could say "that was me!") and just caption the above image. 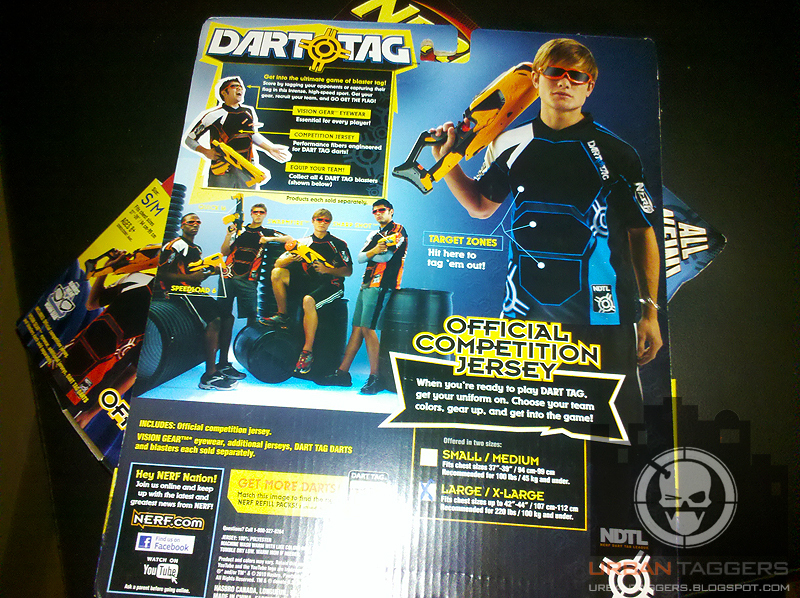 Most original entry that appeals to our judges will win our Speedload 6!! The entries so far have been awesome.. it's gonna be a tough decision! Oooh looky here- 2 player Starter Pack from Amazon. 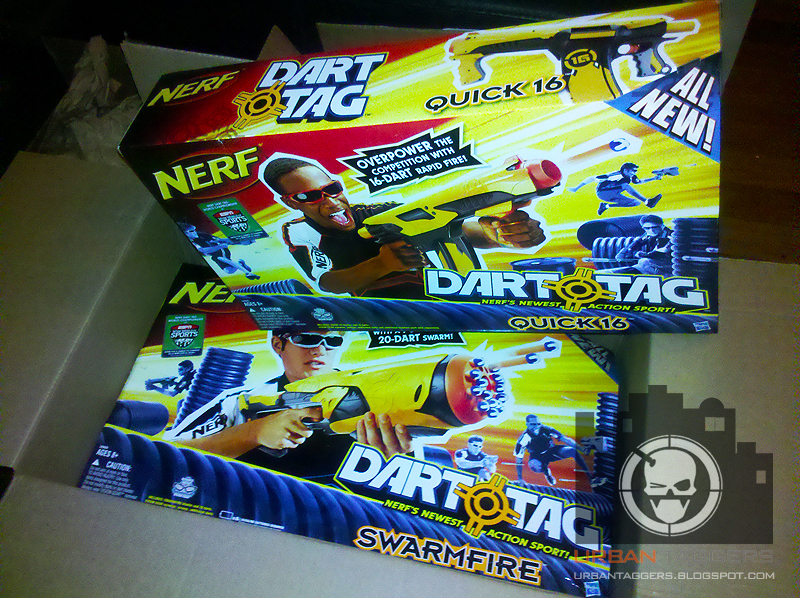 A week ago we posted the great news regarding Amazon.com and their willingness to ship Nerf to Australia. Well as always, we did it ourselves to prove that it's true and lo' and behold, today we've unpacked ourselves a Dart Tag 2 Player Starter Pack, fresh from Amazon in the US to our wondrous lil' town in Australia. The Sharpshot was the only Dart Tag blaster we didn't have, so we were definitely looking forward to this delivery..
"Listen up, Nerf Nation, we know you’re anxious to find out everything you can about the new Nerf Vortex. 9.10.11 is just too far away, and we don’t want to keep you waiting. Here’s the deal. 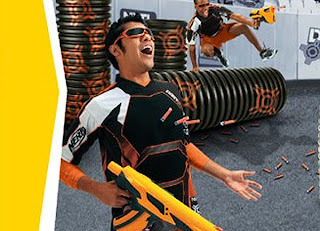 On Monday April 11th we will reveal information, photos and a video of the entire all-new Nerf Vortex line – exclusive to fans of the Official Nerf Facebook page. Think of it as a huge “THANK YOU” to each and every member of Nerf Nation. RSVP now to get all the latest updates, and be sure to tell all your friends to “Like” the page so they don’t miss out! Once you see what we have up our sleeves, you’ll be counting down the days, hours, minutes and seconds til you can Gear Up for 9.10.11. The latest in Nerf evolution has arrived." 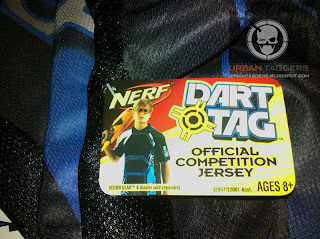 More Nerf Dart Tag Promos: Sigh..
Ahhh well. One day, folks! More details on the Speedload 6 mod to accommodate an Alpha Trooper drum.You may just say "what's the point" and "just use a Recon", but then given the kind of blog Nerf Mods + Reviews is, I think it was a worthwhile exercise. The first thing most of you ask with new blasters is "what kind of mods can you do", so it's normal for them to push the boundaries and mod where modding is possible first..so you the reader can decide if it's worth while or not. 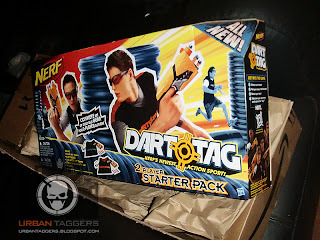 Speedload 6: Real Dart Tag action on a Sunday night.. So much for smart casual dining tonight..
Soo.. what to do in a sleepy town on a quiet Sunday night ? Friends ask us out for dinner; I've got other ideas:) 4 jerseys, 2 Speedload 6's, a Swarmfire and Quick 16 later..
For those of you who just need your foam externally..